This post is sponsored by Sabra. Thank you for supporting the brands that encourage my creativity and work. 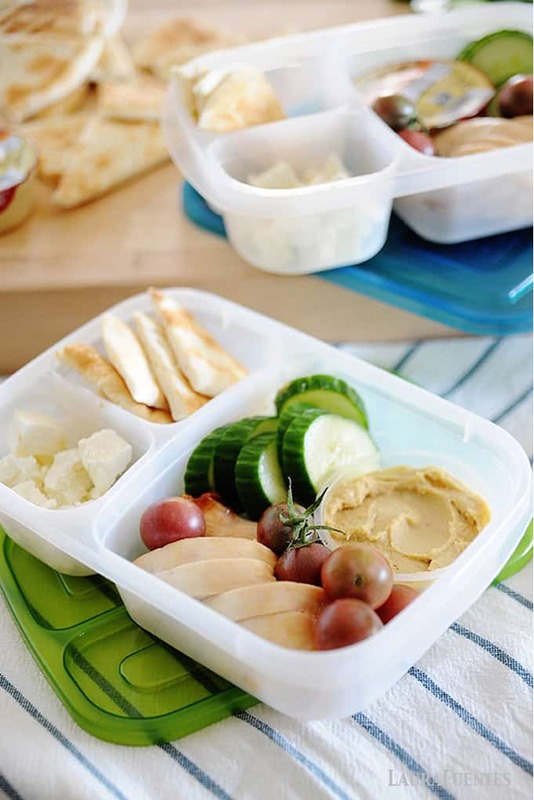 Do you need healthy and quick lunch ideas that can be prepped ahead for school AND office lunches? Look no further because this Chicken and Hummus bistro box has your name written all over it. I think you know where we are headed…and since I’m the queen of leftovers and revamping them into a healthy lunch; I decided to get a little creative with the extra grilled chicken leftover from dinner and turn it into this lunch. 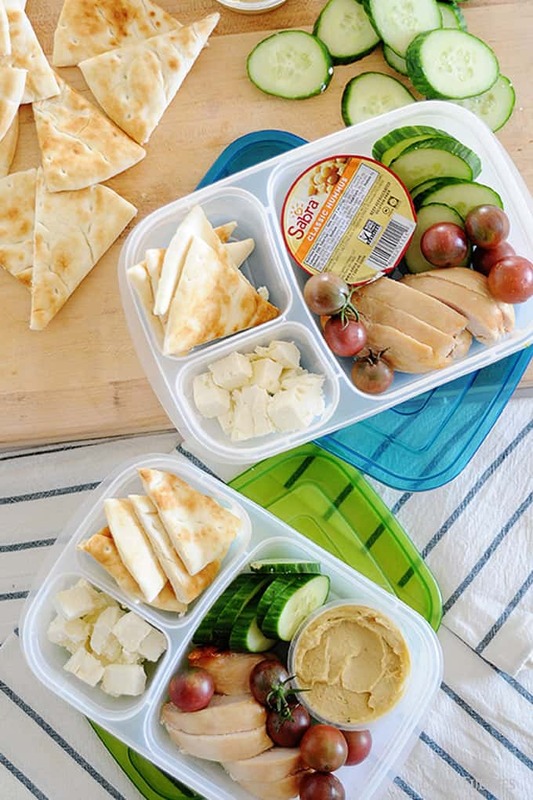 Instead of turning it into a wrap or salad, I used my bistro box obsession to make these Chicken and Hummus Bistro Boxes. This bistro box lunch has All. The. Things! 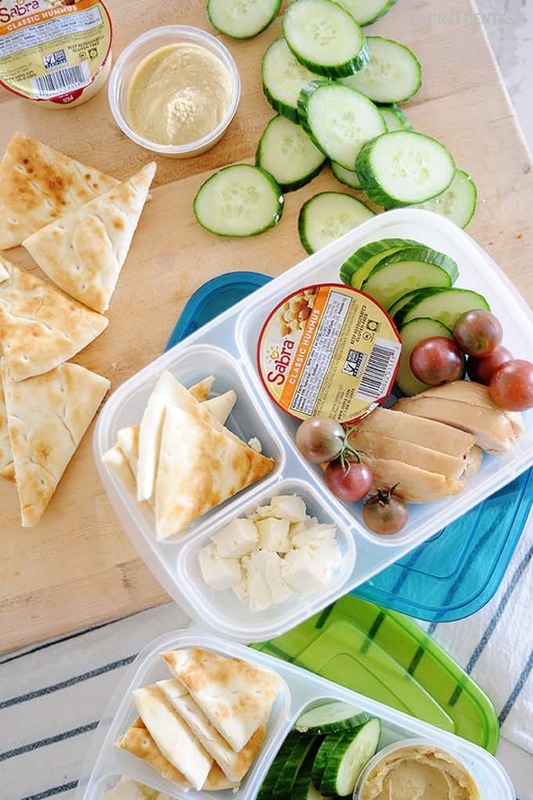 Grilled chicken, veggies, pita wedges, cheese, and the real star of the show, Sabra Original Hummus because in my world hummus goes on just about everything, crackers, cheese, veggies, spoons, and lunchboxes. Am I right? No lie, I plan on cooking chicken once a week for dinner JUST so I can turn leftovers into a lunch. And Sabra hummus? well, that’s a staple in my fridge. As you can see, I like to turn hummus into many other delicious meals because it’s not just for dipping right out of the tub! I mean you can, but it’s hard to resist the urge to not eat half of the tub in one sitting. Which is why I’m such a big fan of using hummus as an ingredient for lunch or even buying the single serve packs and packing them inside an EasyLunchBox. 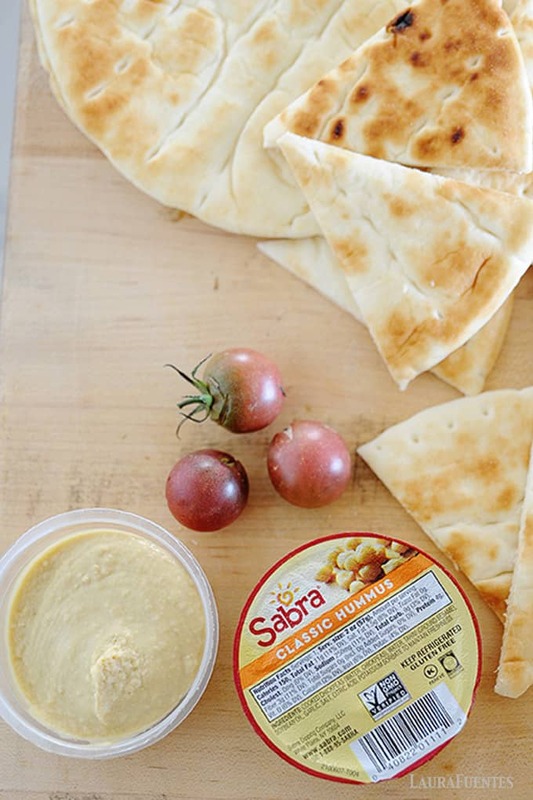 I love that Sabra offers a ton of flavors in their large tub which my family and I love to use so my taste buds never get bored. My go-tos are the Olive Tapenade and of course, I just tried the Taco flavored one and I’m… SMITTEN. Sabra, you’re my hero for supporting my taco obsession. 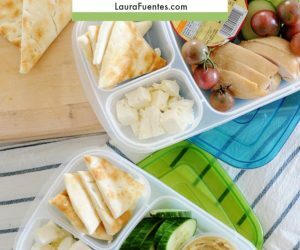 These bistro boxes are super fast to assemble and they work for both kids AND adults, so no need to prep and pack two separate lunches. One prep for everyone. It doesn’t get any easier than that! If you really want to make this recipe totally work for you, make the Greek Chicken Flatbread recipe for dinner; cook extras, and reserve some of everything for lunch. It’s two meals from one. HOLLA! Want to prep these ahead of time? You go for it. 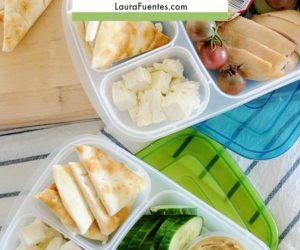 To keep the pita wedges fresh, wait till the morning of to slice them and pack them inside the lunchbox. However, everything else you can prep ahead of time. You could also switch out any of these ingredients for your family’s favorite lunch items like baby carrots instead of cucumber, or hard-boiled eggs instead of grilled chicken. As long as there is hummus to dip them in, you can’t go wrong. 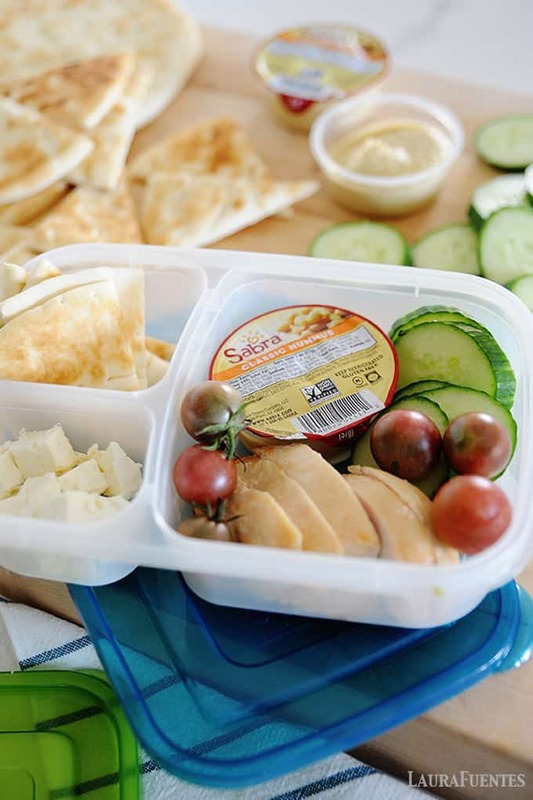 What are your favorite ways to pack hummus for lunch?